How is it possible for a 25-minute meeting to cause Lionel Barber (lead picture, centre), current editor of the Financial Times, to report “one of the most fascinating interviews I have conducted during my 32-year career at the FT”, concluding with this last line: “there are tentative signs that there is more method in the madness than critics suspect”? One US war target Trump was more or less clear about in Barber’s interview: he omitted to mention Russia or President Vladimir Putin. Vocabulary counts for the US president’s public remarks have estimated Trump’s capacity at 200 words or less. According to a ghost writer Trump employed to write one of his books, “he has the smallest vocabulary of any person who has ever run for any kind of [US] office, much less president. It’s a 200-word vocabulary, so as soon he gets beyond that, you know that he’s reading someone else’s words.” Other counts put Trump’s working vocabulary at less than 100 words, joined by the syntax of an average American 5th-grader, by one measurement; an 8th grade reading level by another measurement. Not only is Trump’s vocabulary smaller than his predecessors’; his sentences are also the shortest in US presidential history. For the full interview, as published on April 2 by the Financial Times, click to open. Barber has added a commentary of his own, with a larger vocabulary and more complex syntax, including this modal conditional double-negative affirmative: “As Potus [President of the United States] himself might put it: no fake news in the FT!” Irony, which is unknown in Trump’s public speaking record, is also escaping Barber. Trump was criticized in the Washington media for installing so much gold lamé in the White House after his inauguration. But as research by Pat Paquette has demonstrated, all three presidents before Trump decorated the Oval Office with gold curtains. 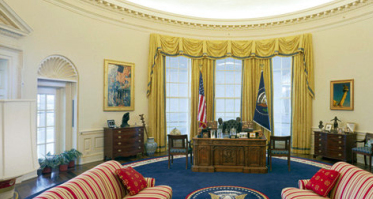 Barack Obama kept the gold brocade hung for George W. Bush for nearly two years before replacing them with red drapery. Years earlier, Richard Nixon had yellow-gold curtains with matching sofas. But according to Paquette, no Trump predecessor deployed gold lamé the way Trump is doing except for Bill Clinton (pictured below). For Paquette’s full story, read this. What remains to be clarified is whether Trump is doing no more than re-hanging the Clinton leftovers.